At the time of the French Revolution there was a great flood of Catholic Priests and Religious escaping across the English Channel. In the main, they were warmly welcomed - the Revolution had unsettled the whiggish English middle classes, and there was still a certain amount of embarrassment about the Gordon Riots, and anti-Catholic pogrom which had resulted in hundreds of deaths just a dozen years earlier. The Priests were often taken in by sympathetic families. One Priest, Pere Louis Simon, came to Ipswich, to the home of Mrs Margaret Wood,a Catholic woman living in Silent Street. At that time, an Ipswich Catholic wanting to attend Mass had to travel to Bury, or to one of the homes of the landed Catholic families, the Gages of Hengrave or the Rookwoods of Stanningfield. Pere Simon began celebrating Mass in Margaret Wood's house in Silent Street, and continuing to do so when she moved to Carr Street. Ipswich, it must be said, was a staunchly Protestant, non-conformist town; even today, Anglican worshippers are in a minority. There was still a certain amount of anti-Catholic prejudice, and the Reform laws giving Catholics equal rights were still almost 40 years away. But eventually, the upheaval in France was over, and Pere Simon returned to settle his affairs, and sell a small amount of property inherited from his family. He returned to Ipswich with the proceeds. He would spend the money, and the rest of his life, re-establishing a Catholic presence in his adopted home. He bought five acres of land on Albion Hill, part of the heathland of what was then the eastern outskirts of town. The Woodbridge road ran beside it, and Pere Simon built a cottage, set back from this road. Its neighbours were an 18th century house to the east, and the Albion Mills to the north and west. 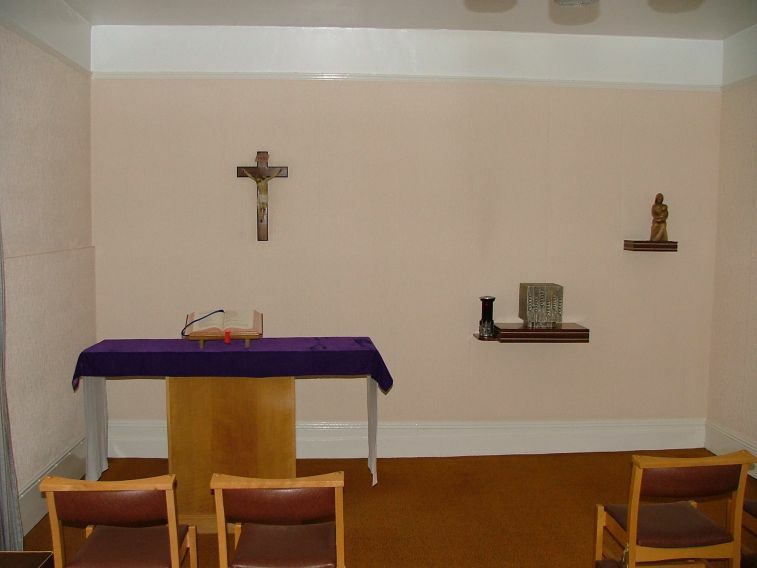 Inside the house, he prepared a chapel, the first permanent home for the Blessed Sacrament in Ipswich since the Reformation. Eventually, when the time was right, he extended the cottage eastwards by building a church, dedicated as Our Lady of Grace. In 1860, the nuns of the order of Jesus and Mary arrived in England, from their base in Lyons. A teaching order, they lived in the house that Pere Simon had built, and established it as their convent. They set up two schools on Pere Simon's five acres of land, probably as part of the same architectural commission as George Goldie's town centre church of St Pancras. The Sisters would survive and prosper, and they still live in the house to this day. However, survival and prosperity seemd unlikely outcomes at the time, for the new self-confidence of Ipswich Catholics would prove to be a little misplaced. 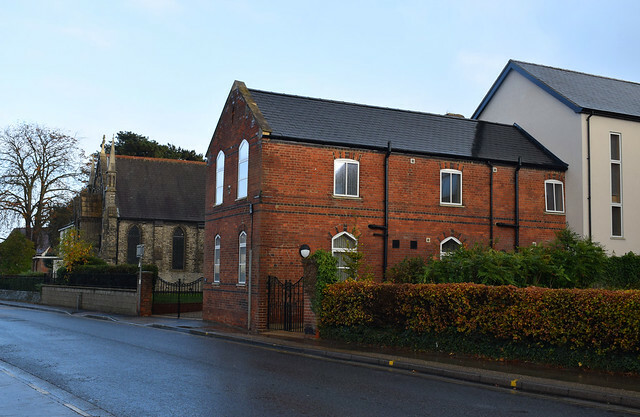 The other Ipswich churches had maintained an amount of anti-Catholic feeling, continuing to preach the 'No Popery' sermons that had dissuaded civic dignitaries from attending the opening of Our Lady of Grace in 1838. The firebrand Protestant ministers whipped up a storm that, one night in November 1862, turned into an anti-Catholic riot. Crowds rampaged through the streets, attacking known Catholic businesses and homes. Their main targets were the two churches and the convent, which they besieged, attacking it with rocks and iron railings. Every window in the building was smashed. The Blessed Sacrament had been brought from Our Lady into the relative safety of the Convent chapel, and the community kept vigil through a night of violence and destruction. As is so often the case, the attack was the catalyst for increased warmth and toleration. The local press denounced the actions of the mob as a disgrace, and local dignitaries visited the community with messages of sympathy and support. Father Kemp became an increasingly popular and well-known local figure. The School of Jesus & Mary became, in the 20th Century, one of Ipswich's most venerable and aspirational educational establishments. In the 1990s it merged with St Joseph's College on the other side of Ipswich at Birkfield, and the schools were demolished, to be replaced by housing. But the convent remains, and the nuns remain too. Mass is celebrated every day, and on the occasions that it forms the parish Mass then all are welcome.